A Christian mission is an organized effort to spread Christianity to new converts. Missions often involve sending individuals and groups, called missionaries, across boundaries, most commonly geographical boundaries, for the purpose of proselytism (conversion to Christianity, or from one Christian tradition to another). This involves evangelism (preaching a set of beliefs for the purpose of conversion), and humanitarian work, especially among the poor and disadvantaged. There are a few different kinds of mission trips: short-term, long-term, relational and ones meant simply for helping people in need. Some might choose to dedicate their whole lives to missions as well. Missionaries have the authority to preach the Christian faith (and sometimes to administer sacraments), and provide humanitarian aid. Christian doctrines (such as the "Doctrine of Love" professed by many missions) permit the provision of aid without requiring religious conversion. From Late Antiquity onward, much missionary activity was carried out by members of religious orders. Monasteries followed disciplines and supported missions, libraries, and practical research, all of which were perceived as works to reduce human misery and suffering and glorify the Christian God. For example, Nestorian communities evangelized parts of Central Asia, as well as Tibet, China, and India. Cistercians evangelized much of Northern Europe, as well as developing most of European agriculture's classic techniques. St Patrick evangelized many in Ireland. St David was active in Wales. During the Middle Ages, Ramon Llull (c. 1232 – c. 1315) advanced the concept of preaching to Muslims and converting them to Christianity by means of non-violent argument. A vision for large-scale mission to Muslims would die with him, not to be revived until the 19th Century. As European culture has been established in the midst of indigenous peoples, the cultural distance between Christians of differing cultures has been difficult to overcome. [ clarification needed] One early solution was the creation of segregated "praying towns" of Christian natives. This pattern of grudging acceptance of converts played out again later in Hawaii when missionaries from that same[ which?] New England culture went there. In the course of the Spanish colonization of the Americas, the Catholic missionaries learned the languages of the Amerindians and devised writing systems for them. Then they preached to indigenous people in those languages ( Quechua, Guarani, Nahuatl) instead of Spanish, to keep Indians away from "sinful" whites. An extreme case of segregation occurred in the Guarani Reductions, a theocratic semi-independent region established by the Jesuits in the region of the future Paraguay between the early 17th century and 1767. American " Hard-shell Baptists", " Anti-Mission Baptists", or "Old School Baptists" adhering to strict Calvinism rejected all mission boards, Bible tract societies, and temperance societies as nonbiblical. The mainstream of the Baptist denomination, however, supported missionary work. A wave of missions, starting in the early 1850s, targeted inland areas, led by Hudson Taylor (1832–1905) with his China Inland Mission (1865– ). Taylor was later supported by Henry Grattan Guinness (1835–1910) who founded (1883) Cliff College, which continues as of 2014 [update] to train and equip for local and global mission. The missions inspired by Taylor and Guinness have collectively been called[ by whom?] " faith missions" and owe much to the ideas and example of Anthony Norris Groves (1795–1853). 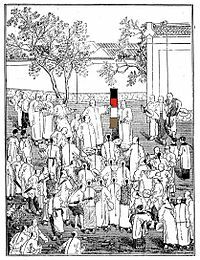 Taylor, a thorough-going nativist, offended the missionaries of his era by wearing Chinese clothing and speaking Chinese at home. His books, speaking, and examples led to the formation of numerous inland missions and of the Student Volunteer Movement (SVM, founded in 1886), which from 1850 to about 1950 sent nearly 10,000 missionaries to inland areas, often at great personal sacrifice. Many early SVM missionaries traveling to areas with endemic tropical diseases left with their belongings packed in a coffin, aware that 80% of them would die within two years. In 1910, the Edinburgh Missionary Conference was presided over by active SVM and YMCA leader (and future Nobel Peace Prize recipient) John R. Mott, an American Methodist layperson, the conference reviewed the state of evangelism, Bible translation, mobilization of church support, and the training of indigenous leadership. Looking to the future, conferees worked on strategies for worldwide evangelism and cooperation. The conference not only established greater ecumenical cooperation in missions, but also essentially launched the modern ecumenical movement. An equally important dimension of missions strategy is the indigenous method of nationals reaching their own people. In Asia this wave of missions was pioneered by men like Dr G. D. James of Singapore,  Rev Theodore Williams of India  and Dr David Cho of Korea. The "two thirds missions movement" as it is referred to, is today a major force in missions. Most modern missionaries and missionary societies have repudiated cultural imperialism, and elected to focus on spreading the gospel and translating the Bible. [ citation needed] Sometimes, missionaries have been vital in preserving and documenting the culture of the peoples among whom they live. The word "mission" was historically often applied to the building, the " mission station" in which the missionary lives or works. In some colonies, these mission stations became a focus of settlement of displaced or formerly nomadic people. Particularly in rural Australia, missions have become localities or ghettoes on the edges of towns which are home to many Indigenous Australians. The word may be seen as derogatory when used in this context. Church planting by cross-cultural missionaries leads to the establishment of self-governing, self-supporting and self-propagating communities of believers. This is the famous "three-self" formula formulated by Henry Venn of the London Church Missionary Society in the 19th century. Cross-cultural missionaries are persons who accept church-planting duties to evangelize people outside their culture, as Christ commanded in the Great Commission ( Matthew 28:18–20, Mark 16:15–18). The objective of these missionaries is to give an understandable presentation of their beliefs with the hope that people will choose to following the teaching of Jesus Christ and live their lives as His disciples. As a matter of strategy, many evangelical Christians around the world now focus on what they call the "10/40 window", a band of countries between 10 and 40 degrees north latitude and reaching from western Africa through Asia. Christian missions strategist Luis Bush pinpointed the need for a major focus of evangelism in the " 10/40 Window", a phrase he coined in his presentation at the missionary conference Lausanne 1989 in Manila. Sometimes referred to as the "Resistant Belt", it is an area that includes 35% of the world's land mass, 90% of the world's poorest peoples and 95% of those who have yet to hear anything about Christianity. The Europeans contact with indigenous since 1492 has killed 100 million from the imported diseases to which tribes had no immunity. Missionaries, along with other travelers, brought diseases into local populations. Smallpox, measles, even the common cold, have been blamed on their arrivals. David Igler of the University of California, Irvine, includes missionary activity as a cause of spreading germs. However, he says that commercial traders were the main agents of disease. ^ a b Walls, Andrew F. (November 2016). "Eschatology and the Western Missionary Movement". Studies in World Christianity. 22 (3): 182–200. doi: 10.3366/swc.2016.0155. ^ Igler, David (June 2004). "Diseased Goods: Global Exchanges in the Eastern Pacific Basin, 1770–1850". The American Historical Review. Chicago, Illinois: American Historical Association. 109 (3): 693–719. doi: 10.1086/530552. Retrieved 2011-11-20.